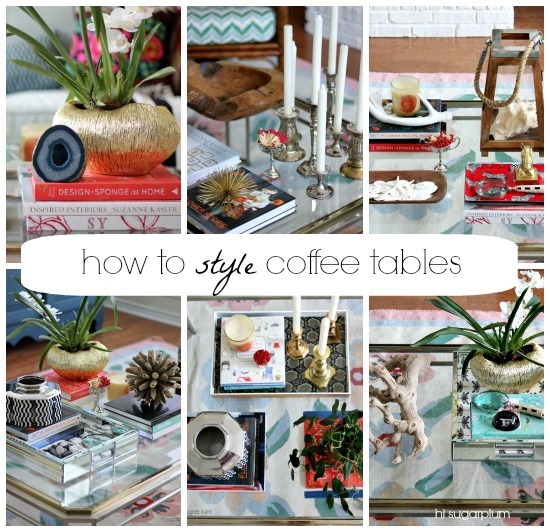 How to Style Coffee Tables (1 Table, 6 Ways) | hi Sugarplum! Hey, hey, and Happy Monday. I hope ya’ll had a grand weekend! We had glorious Fall weather, lots of family time outside, and a date night…pretty much perfect. We saw Gravity, and oh-em-gee, go see it!! And fork out the extra money for the biggest, 3D screen you can find. It will certainly crush any dreams of becoming an astronaut. I am so super excited for today’s post, and it’s a doozy, so settle in and give your scrolling finger a workout. After the sofa, the coffee table is the most visible piece in the Living Room. And while the bones of a room are important, it’s the accessories that transform it. 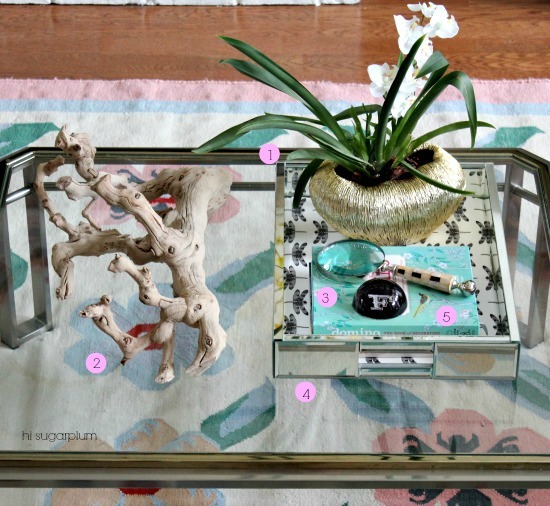 Lucky for me, styling the coffee table is my idea of a fun time. I spend many Saturday mornings puttering around the house, moving accessories from room-to-room. But it can also be very frustrating to find the right mix, so I thought I’d share my formula, and show it in action in six different set-ups. 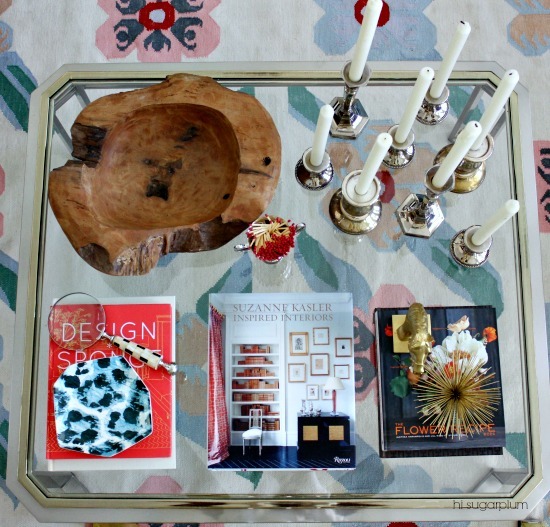 That’s right, one table, styled six ways! 1) Life or natural element to bring the outdoors in and add color and texture. 2) Books to entertain and create stacks for different heights. 3) Quirky or statement object for conversation starter. 4) Candles for ambiance and a welcoming scent. 5) Tray to corral smaller items and organize. Tip: Place matches in a cute vessel, or from a favorite restaurant, for a sentimental touch. Tip: Accessories don’t have to be bought in a store. We found these little stones on a beach in Italy, and seeing them always makes me smile. Tip: Use unconventional vessels for plants and flowers. Tip: Vary the shapes of each object for more interest and balance, and don’t be afraid to go bold with a statement piece. 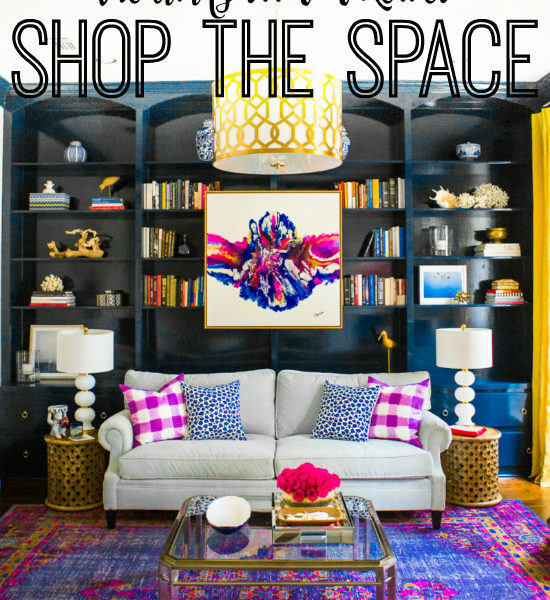 Keep reading for three more vignettes and a chance to win a HomeGoods gift card! 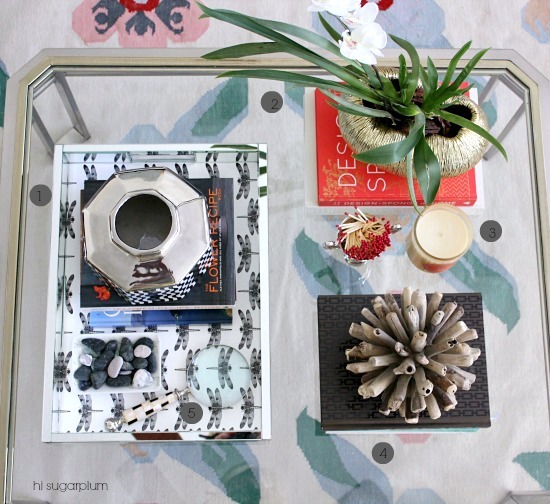 Tip: Change the look of a tray by lining it with duck tape, fabric or paper. Tip: Don’t be afraid to mix metals for even more shine and reflection. Tip: Life doesn’t have to be in the form of a plant or flowers. Shells and driftwood bring the same element of the outdoors in. Tip: Don’t forget to look in your Kitchen cabinets for plates and bowls that can double as small trays. Tip: Spraypaint is your friend! Don’t overlook a cool object because you don’t like the color or finish. Tip: Vary the height and scale of objects. Use books to create different levels. Tip: Fill the space or else the objects will look lost. Whew! I told you that was a doozy! And the scary thing? I loved every second of creating these, and could have put together six more! HomeGoods knows that small changes like these can boost our moods, but don’t have to break the bank. 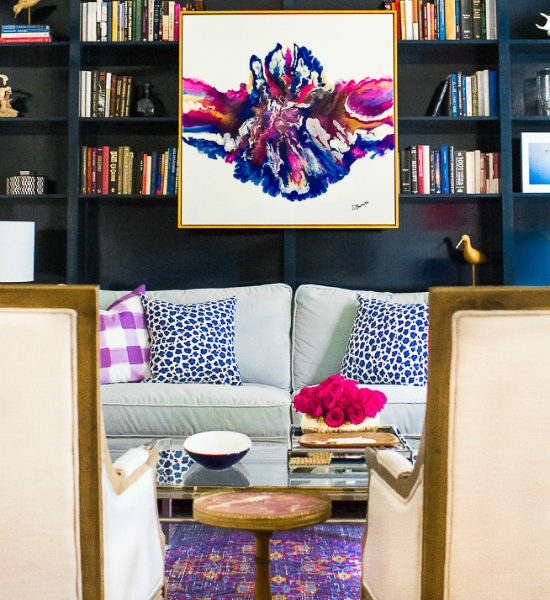 They recently partnered with Genevieve Gorder to promote their Happy Home Resolutions, and I’m thrilled to share how I personalized my space. 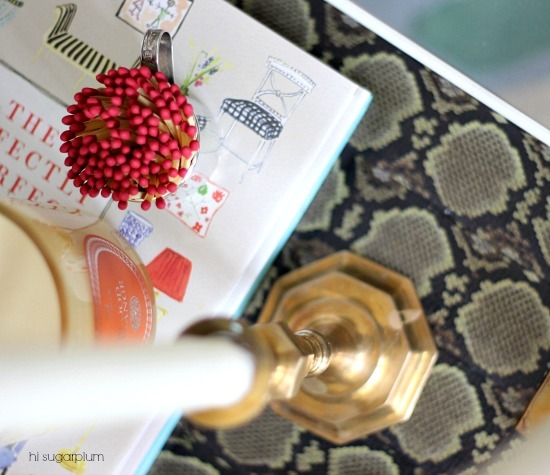 After all, HomeGoods is my go-to spot for interesting, and affordable, accessories! For a source guide for everything shown in this post, click here. Popular Projects and Project Gallery! HomeGoods graciously provided me with a gift card to help personalize this space, but the images, opinions and puttering around are all mine! Thanks for supporting Hi Sugarplum! sponsors! I can't decide on one, I love them all. Thanks for post like this simplifying deco! They all look amazing Cassie. 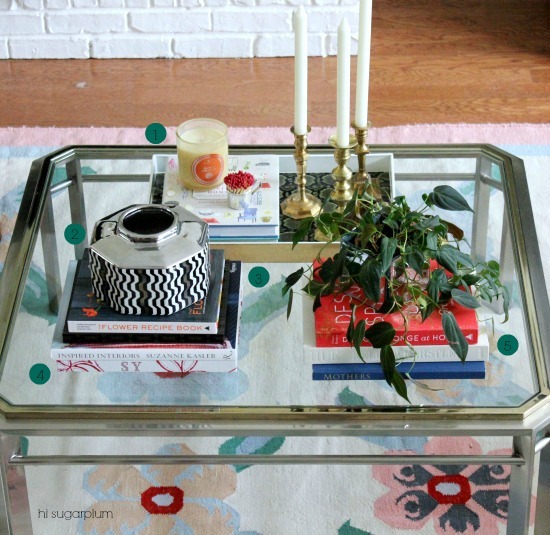 We have a curio coffee table, so it is the inside of ours that gets styled. Love these ideas!! I probably like two best since it's a bit more minimal. I can never apply this sort of thing in real life. My coffee table is overflowing with paperwork, so everything has to fit on one tray to be moved when we need more space. I love the matches in the silver cup cup! Such a cute idea. But where do you strike them? Thank you!! I actually taped a piece of the striking strip from the matchbox directly to the bottom of the cup! 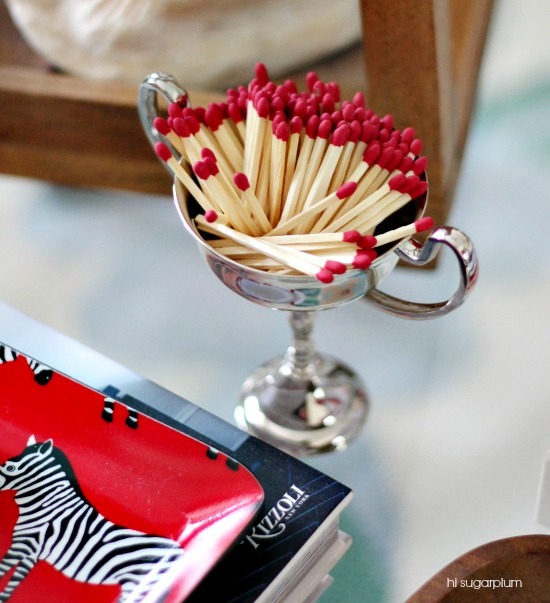 I love the idea of keeping the matches out in the little silver cup! I'd love to see more styling post like these! Keeps my own creativity flowing! My favorite is #1. Like seeing different ways one piece can be styled. I like vignette 2 and 3 the best! Great tips. Number 4 is my favorite,love the beachy elements! Yes please to more styling posts! I love all of these! It sounds odd, but I especially love the display of matches in the goblet. It's so much prettier than just having a lighter lying around! Thanks Sarah! That little trophy goblet was a HomeGoods score! It had a weird plastic base, but I just took it off!! I love style # 1 the best. That tray just draws my eye right to it and the accents are perfect. Amazing piece of driftwood. I would love to see more posts like this. 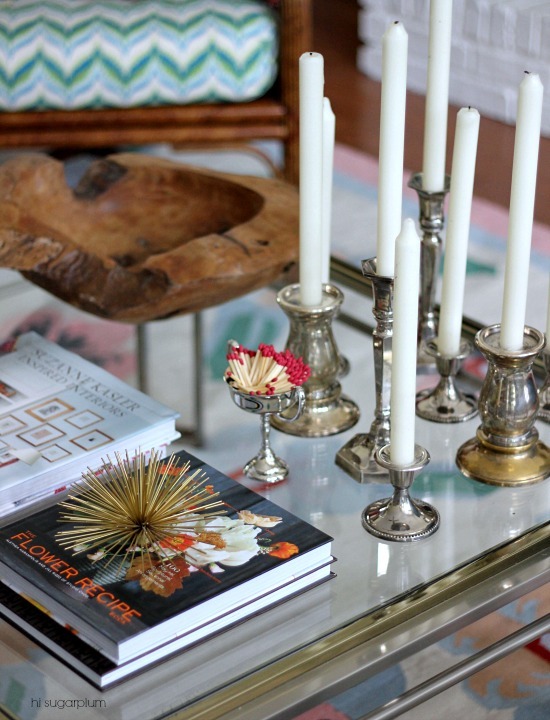 Love the mix and match silver candlesticks! 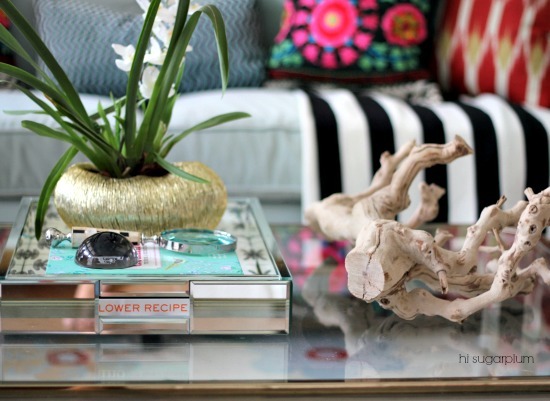 I like #2 the best…love the driftwood statement piece. I enjoy these styling posts and learn something every time. Thanks! I like #1 and 3….. I love your styles ! 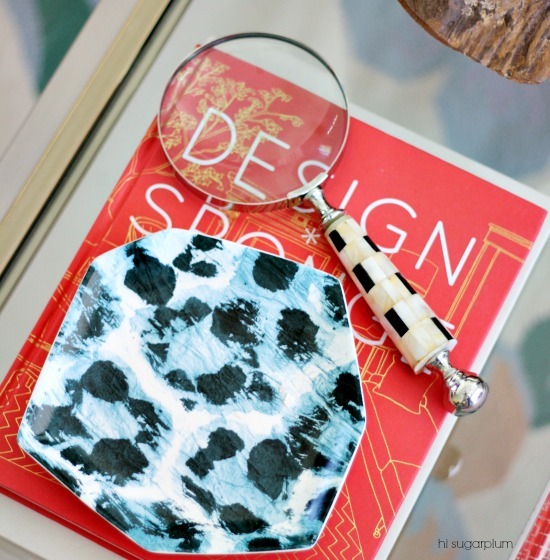 I love style 2– the driftwood & magnifying glass are great pieces. I know what I'll be on the look out for on my next beach trip & thrifting! Thanks Amanda! That driftwood is actually from HomeGoods!!! Crazy, right?? 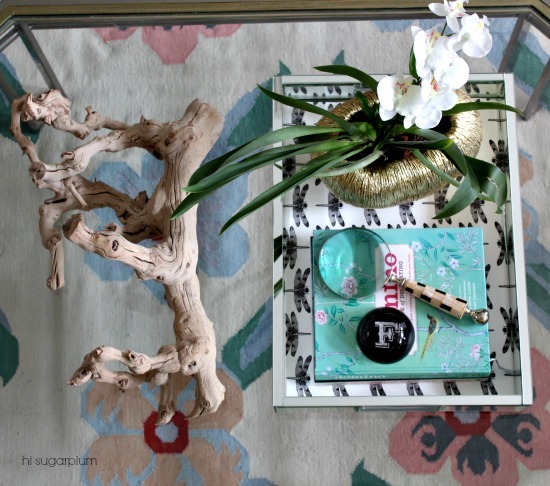 I love #2 and #4… The simplicity of the driftwood and tray is fab but I adore the zebra tray. Yes, I would love more of these posts! Thanks, Laura! That red zebra tray is from Furbish! I love that gold bowl and the dragonfly tray. A few years ago a Homegoods opened less than a mile from my house – can you say dangerous. My favorite is the first one. I would love more posts like these! Thank you for breaking it down into simple steps so it doesn't feel so intimidating. I love the driftwood. I have a piece that has been sitting in a closet that would work well on my coffee table! i like 3. not too much, not too little. and yes, decorating is good! I'm lovin that drift wood!! Thanks for all the different ideas… Awesome! Tough choice! Two or six are my favs 🙂 LOVE styling posts! Love, love, love the bowls of shells. Have one very similar!! I love all of them actually. And I haven't met a tray I don't like. I am a huge fan of driftwood … love the way you used it! table 2 is my fav…. GIRL! This post was fabulous! Such pretty pictures and such great tips and information. One of my favorite posts you've ever done. And you KNOW I love HomeGoods. Some of my favorite things in my house are from there!!!! I love the first one, I really like both trays would love to know where they are from? did you put paper on the bottom of the first tray? Thanks Savvy!! The mirror tray is from Target, with HomeGoods wrapping paper on the bottom. And the gold tray was found in the clearance section of HomeGoods, and I covered the (ugly) bottom with snakeskin duck tape! Hope this helps! I love styling tips, so please do more. I think I like #2 the best. I like 2 the most. I think all of them look great though! I would love to see more posts like this. It helps to see different design options all in one place. Thanks for the giveaway! love the one with the pops of red (surprising, because red is my least favorite color!) but that zebra tray is gorgeous! I like 1 the best! But I'm so impressed with how many styles you came up with. They all look great, and you make it look so easy. Also, your pictures are fantastic. I still need to really practice using my camera. Yes, bring on more style posts!! You found the dragon fly paper!!!! They all look great, Cassie. Nicely done. I would have to go with #2! I like the simplicity of it! I love look 1 & 2. I think I would try to combine them on my own coffee table. Such a fun post! My favorite looks has to be #2. It's so perfectly understated but elegant! Great vignettes! I'm a fan of vignette #2! I have three small children and that arrangement is definitely one I could emulate without too much potential damage or knocking over! Although, I can see them picking up those antlers a thousand times which then has me telling them to "Put it back!" a thousand times. . . and so on. I love your idea of using a cute vessel to corral matches. 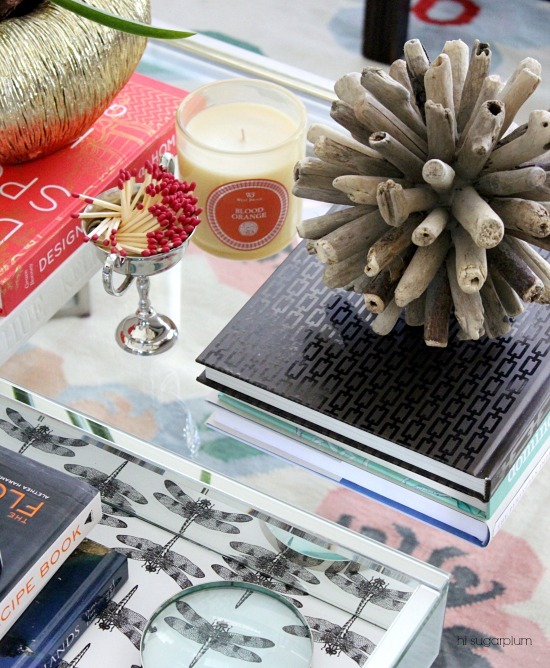 I am definitely incorporating that into my coffee table styling! Hard to pick a favorite, but I think I'll go with #2! And yes, please do more styling posts like this! They are inspirational! I think # 4 is my favorite. Please do more styling posts! They are building a Home Goods in my town right now! Oh man, I love this post! I am amazed at how many cool ideas you came up with. My fave is probably #4 because you used the horse head and the antler.. they are all really great though 🙂 Yes to the question about more posts like this !! I like 2 the best! Yes, more styling posts! Thanks for the chance to win. I like the 1st vignette- the grouping into 3 really appeals to me. 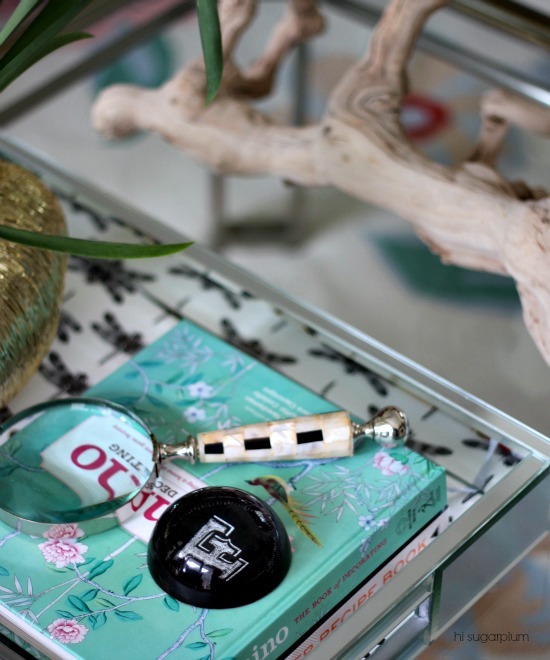 I would love to see more posts like this too, I'm kind of clueless when it comes to accessorizing and placement and am excited to try my hand at it when we move into our 1st home later this year! The first one is definitely more my style. It's simple, but interesting and elegant! I completely love it!! I like #1he best and would love to see more styling posts. I love them all! And I love this kind of post – yes, more more more! Number 6 is my fave. 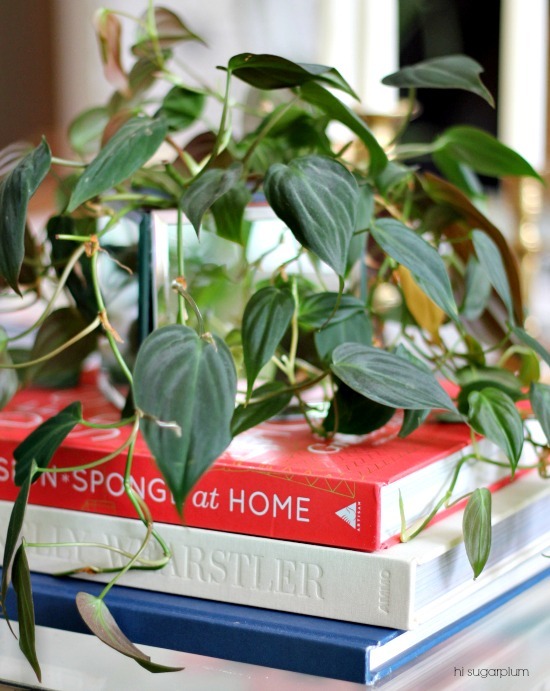 I love the orchid pot plus the pop of red from the book. I like them all. I clear my coffee table because the dog's tail would wipe out everything on it. LOL I happen to like it bare…less clutter. Love them all! Great way to change up the room a little bit! Love the idea of the matches on display! Would love to see more styling posts! I like the first one the best! I love #2 best…the driftwood and the colors..spot on…leaves some space for the eye to rest too. Lovely all of them though. TFS! I like them all but #1 is my choice. I would like to see more posts similiar to this in the future! So helpful and So fun! I love all the looks! 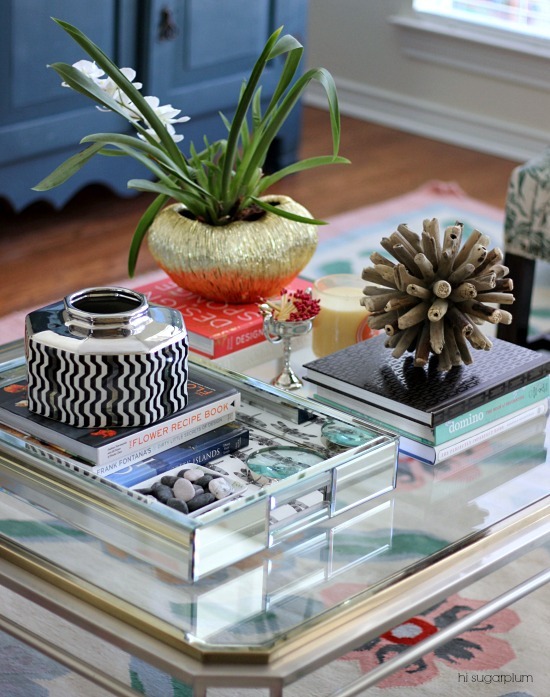 I'm going to play around and try to make my coffee table look better. Thanks for the tips! Five. 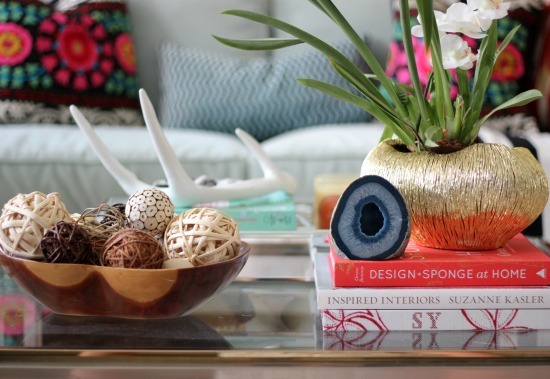 I love the wood bowl and gold urchin! 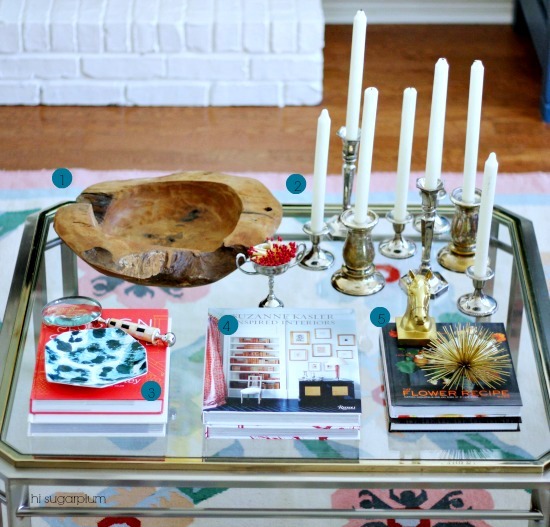 I never would have thought to put so much stuff on a coffee table! My favorite is the idea for the matches in a small vessel. I miss having matches like that around, now I must get some for my candles. Thanks, Cass! 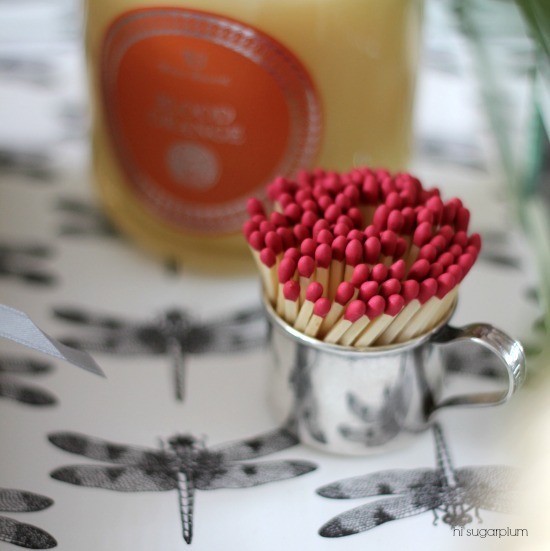 I never would think to leave matches out as a decor item! That's so smart! And a quirky item makes it so fun! 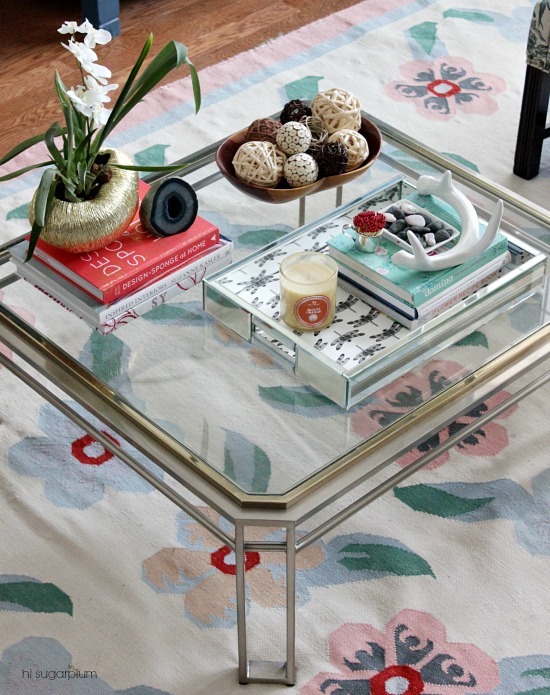 You just gave me inspiration to style our blank coffee table. I would love more posts like this, very inspiring. I love them all! Thank you so much for this:) I was just thinking of switching things up for my 'coffee table'. Mine is an upholstered footstool. How would you do things differently?! love these ideas! I like the distribution of things on the table! Looks well decorated but simple and uncluttered. All good ideas for what we all struggle with in some way or another. I love the first one. The gold bowl repurposed as a pot for the plant is genius! My favorite is # 4 and love these type of posts! I like them all but I think #1 is my fav. I love these types of posts! i swoon over the first one!!!! and darn if i didn't ever think of that match idea. how cute is that…but how much does it make sense too!?!? LOVE it. and i'm also obsessed with orchids too which tips me toward the first look! I like the one with the driftwood, it's simple and looks nice. Plus with little ones running around, fewer things to break, knock over, or use as weapons! I like numbers 2 and 4 the best. The driftwood is beautiful, as is the wood and glass container (lantern?). Thanks for the inspiration and the great giveaway! I too love styling and re-styling areas of my home. Thanks for all the great ideas!! Such great tips Cassie! Love all of these looks! I really like all of the different arrangements, especially #1! 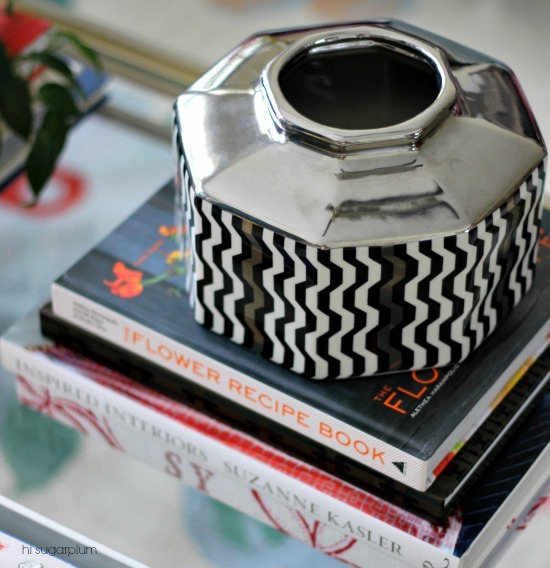 I also enjoy spending time moving accessories around and restyling my home. Always enjoy your posts! 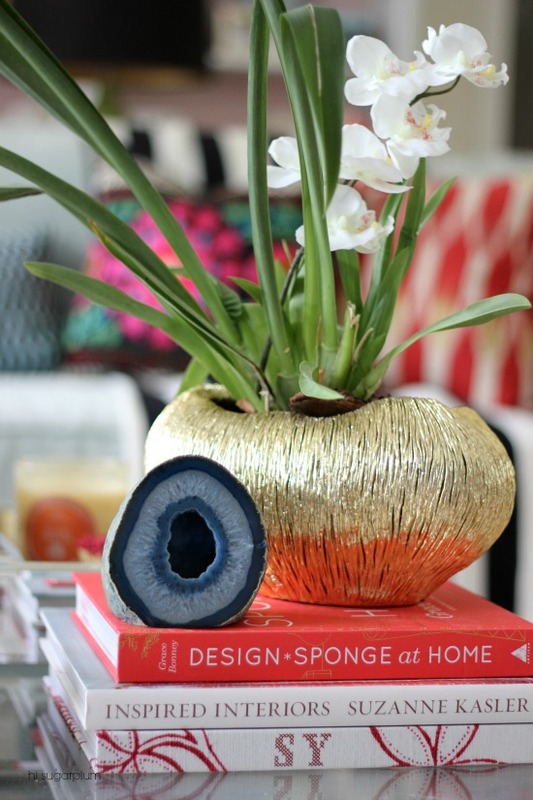 I love your orchid and the container it's in – so beautiful! I liked them all but #2 was my favorite with the driftwood. I liked the last one best! 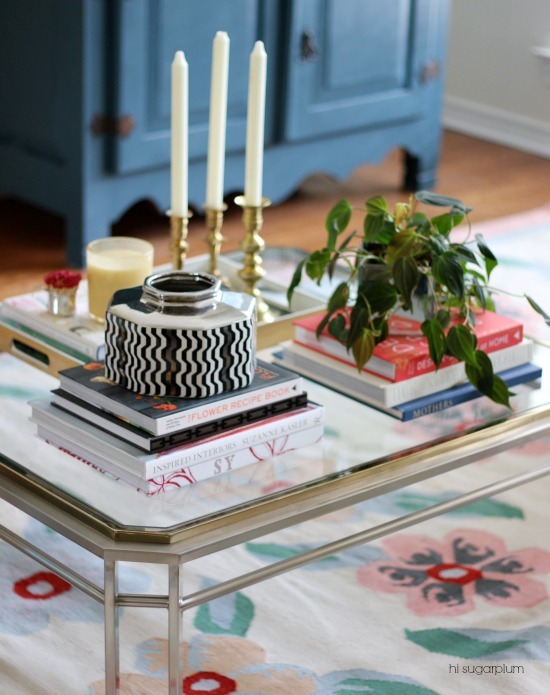 And I would love more styling posts….it's nice to have a formula for success! This quirko loves doing the same thing on Sat am!!! 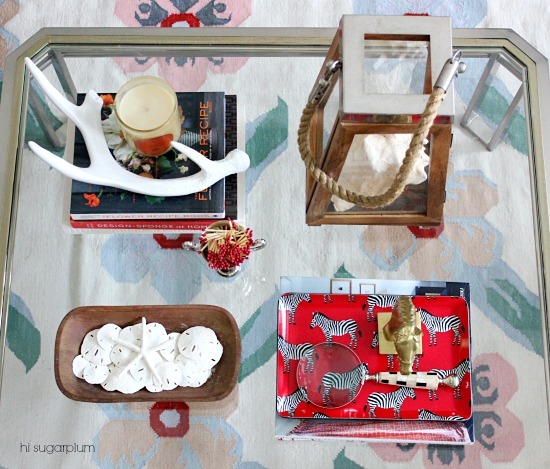 Love all of the vignettes but #3 is my fav with the zebra tray and beachy lantern! Love the blog. kathy b.
I like the one with the gold horse… I don't have a coffee table because of a rambuncious 2 year old but maybe one day in the future I'll actually be able to put these to good use! Right now I have an oval tray on my square table, with three things atop the tray. However, the whole thing looks so sad. Perhaps I'll have a little styling fun today. After all, I love to freak out my husband by making things look different from the time he leaves for work to the time he comes home! Drives him nuts. He's all about leaving things alone. All so pretty Cassie! #2 is my fave, I think 🙂 Love the dragonfly paper and adorable zebra tray. 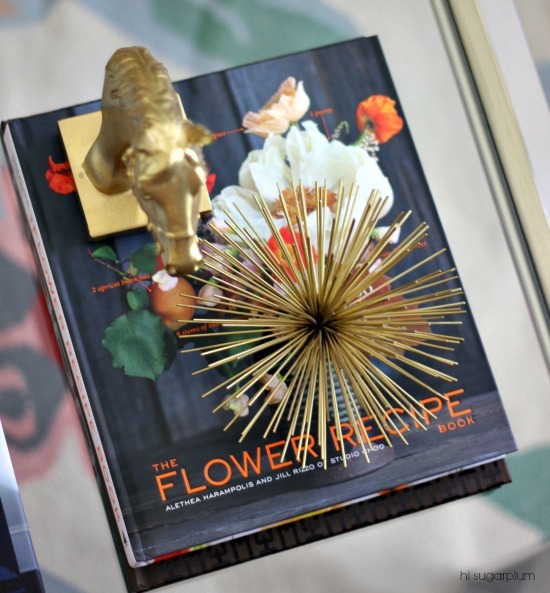 And gold spikey thing…I need one of those. Loved this post! #2 is my FAVE!! I love all the different accessories….but this one is has the least amount of things on it….and I think that would work better for my house! You're good. DAMN good. If I sent you a gift card would you come style my house?!?! They're all great. Shows that there really is so many different options when it comes to styling. Wow, those are amazing! I have that big chunky wood bowl too. Love it but never sure what to put in it! Love these demos. I too am forever rearranging my table, but see I need to add something quirky. They all are great. The options are endless! I like the matches out, I never realized they could look so decorative. I love things that are both decorative and functional. These look fabulous, I love your photos and great ideas!! 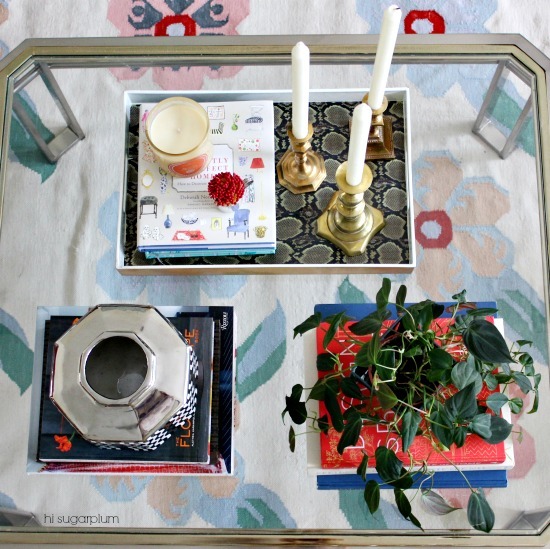 Love #1– I am lusting over that mirrored tray!! I have been looking everywhere for an affordable option! Hey Liz — that tray is from Target! I actually saw some similar at HomeGoods…I just put a piece of paper on the bottom to cover the random design! I like #1. My husband and I have a running joke about antlers/animal heads so that display wins it for me. And I would like to see more posts like this, it's fun to see how others style things. It gives me ideas for my own home. Agates, Wood and Gold, All Of My Favorite Things! I can't choose which one I like more, love all the looks! I try and style my coffee table too but my boys wreck it within minutes..but its fun and gratifying for a few minutes any way. Love the first and third one! Who am I kidding? I love them all! I love all of them and I love the idea that it's super easy to change out a few pieces to change the whole feel of a room or vignette. I LOVE the piece of driftwood! Where did you find that piece? Hey girlie — thanks so much! That driftwood is actually from HomeGoods!!! Great find, right?! Hi Michelle — I'd stick with a group of 2 or 3 for a long table…I can work on a post for that size table, too! I love the driftwood! Feels like the beach! I have purchased driftwood from Homegoods! It is always a conversation piece!! Love love love love love this post! Next…bookshelves! Already pinned to my styling files. Great job! Love all of them! I can decide between 2 and 6! Thank you for the great ideas! 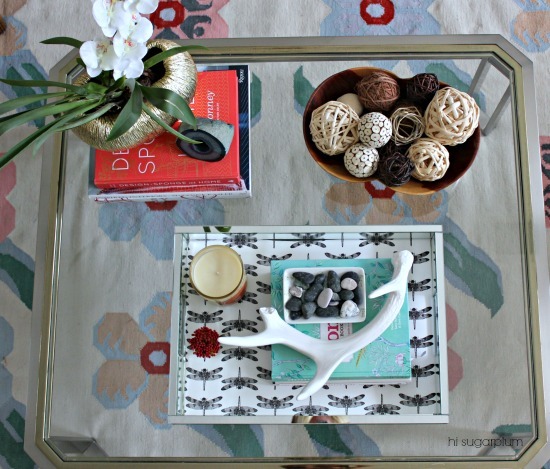 Coffee table styling is the hardest for me! Would definitely like to see more posts like this! I love number two… the driftwood is gorgeous! 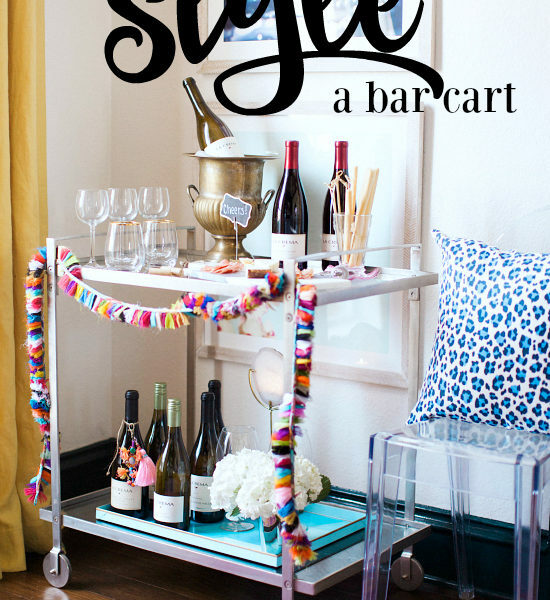 I struggle with styling tables and shelves, so this post was a huge help to me! Number four is my favorite – I love the touches of red! 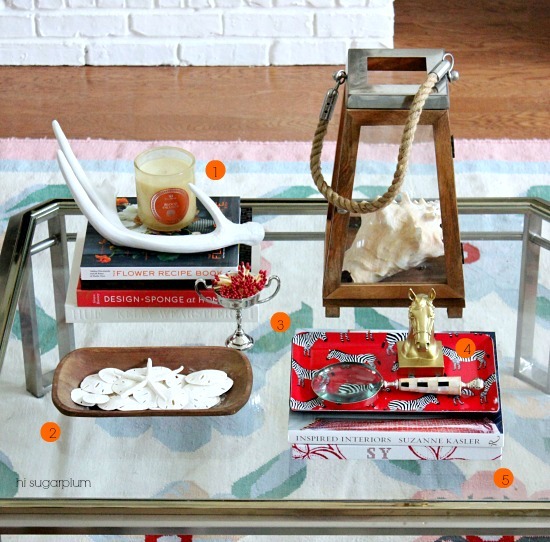 I have an antler on my coffee table as well, and I know they're all over blog land right now, but it's definitely a conversation starter. It was worth the poison oak I got traipsing through the woods to get that thing! 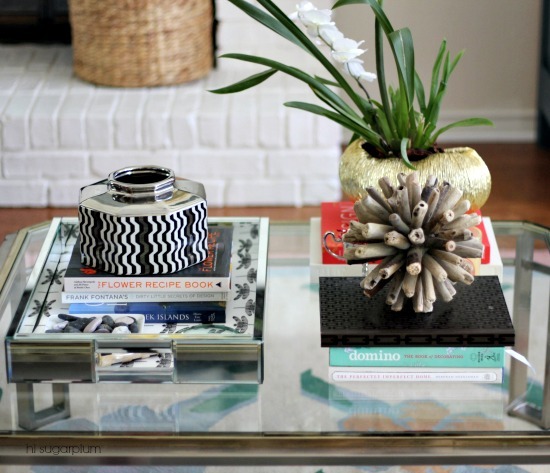 It's great idea to use these tips to decorate your coffee table. 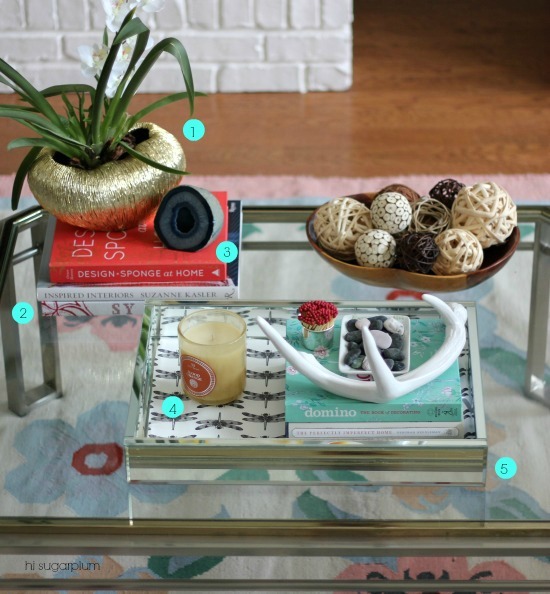 I'm clueless when it comes to styling my coffee table. Thanks for some great inspiration! Number 2 ~ I LOVE driftwood in any shape or form! I love all of the tables, especially the drift wood. At my house I have to keep it simple so we can clear the table with one hand for games and building blocks. Maybe one day I'll have a vignette. My favorite is number 5. Candles. Candles. 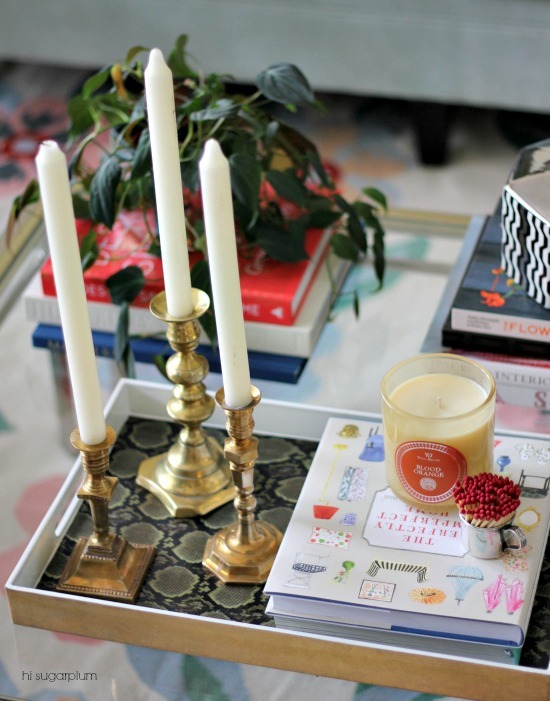 Candles…and I love me some metal shiny objects (gold, brass and pewter are my favorite accent colors)!!!! Honestly, there are elements of each one I really enjoy, and while I don't have a stand-out favorite, I would choose #5 if I had to choose just one. I'm terrible at vignettes. World class terrible. #1, and yes I would love to see more styling posts! I like number three and I would love to see more posts like this, they really appeal to me! I love them all. 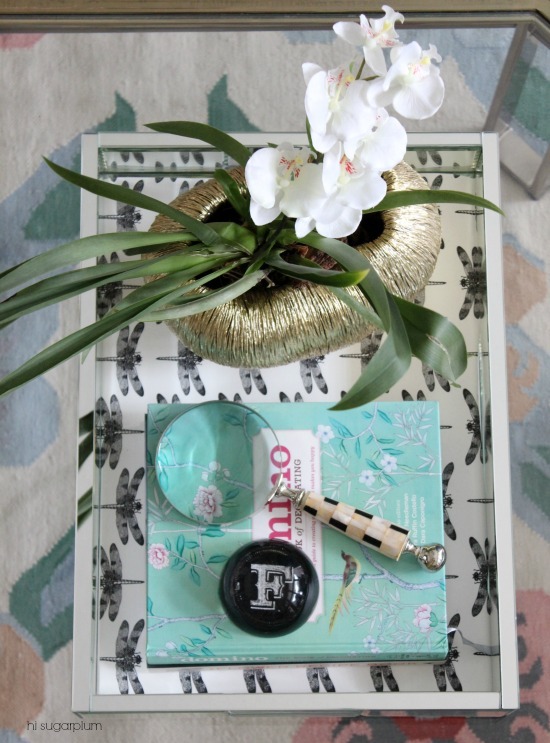 I totally agree about the plant and tray – totally styling musts! So fun! I love finding random things to put out on my tables! 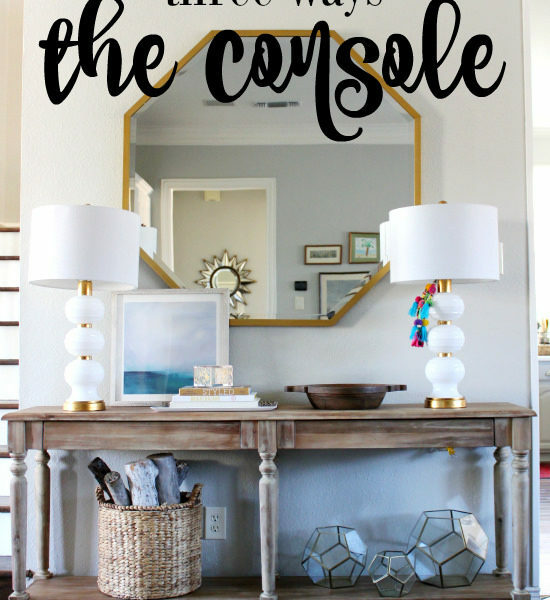 I love these ideas – I look forward to the day when my kids are a little older and I can actually decorate my coffee table! I LOVED this post and would love more styling posts, I have to say I loved the gnarled branch the best so that table "scape" was my fav. My favorite is the first one with the antler! 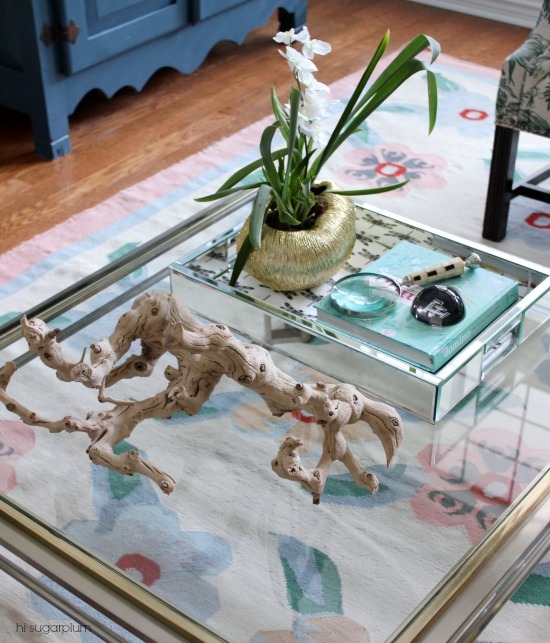 Now I want to go home and restyle my coffee table! thank you for the tips – they all look great! I think I like the last one the best. Love number two! Simple, easy to move things to clean too. I like 3! These are fantastic posts – because I'm terrible at styling. I especially need some work styling booksheleves that have to hold a lot of books! I liked the first one. Just seemed most like something I would do. You make me wish I had a coffee table! I like 1 the best and I would love to see more posts like this. I love the way you display matches! Such a great use for special small containers! I will use this idea…thanks. These are fantastic tips! I am terrible at home decor so this is a huge help. Very Nice Post.This information will increase more and more people to know about buying online furniture.I use to do buy furniture online as its time saving. In some situations, you could have a rectangular or oval dining table. You could put a couple of seats at the table closures and different situate sorts at the sides of the table. In such a case, the closure chairs might tower over the side ones. This is a regular game plan and it will look okay. The point when picking your dining room furniture sets, think about the width and profundity varieties. The width and the profundity of kitchen table and chairs might fluctuate. On the other hand, the variety should not give an illogical look. Choose measurements that will suit an individual of normal size. Then again, if your relatives or continuous visitors are very substantial or less, you might change the chairs requirement accordingly.